Just Backdated: ROBERT PLANT - Part 1 of 3 part Interview. One of the odd things about working for Melody Maker was that the stories and interviews that we wrote were sold to other magazines around the world. Many of the pieces I wrote appeared in a mag called Go Set in Australia, and also a mag in Sweden in which they were translated. This particular one was reproduced in May 1976 in Creem in the US, one of the best rock mags ever, so I wasn’t going to complain about it. Of course, the only stories that were syndicated in this way were those with the big guys, Lennon, Bowie, Townshend, Jagger, Zep, CSN&Y, Floyd, etc, because the mags outside of the UK and US wouldn’t have had the access to these guys that we did. This was the third and last interview I did with Robert, always the most forthcoming of Led Zep, the friendliest too. Jimmy was too wary and mysterious, JPJ couldn’t really be bothered and Bonzo wasn’t the interview type. I remember meeting up with Robert outside his hotel on the street on the south side of Central Park in NY, and how he was raving about an Indian restaurant that he’d found in the city. In those days Indian restaurants were a bit of a rarity in NY. Robert’s wife, of course was Indian, so he was gagging for a chicken madras. He was still hobbling a bit, on crutches. This is how Creem published my interview with Robert that had already appeared in MM, although I’ve reworked it a bit. It’s a bit long, so this one, like some other posts, is in three parts. 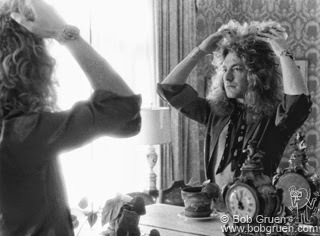 This picture of Robert was taken by my pal Bob Gruen while we did the interview in his suite at the Plaza Hotel. THE EVER-ELUSIVE Led Zeppelin surfaced in New York in January [1976, cc] at the Park Lane Hotel on Central Park South. Jimmy Page was accounted for, his mission being to finish mixing the soundtrack of the long-awaited Led Zep movie. The rest of the boys were just in town for "social reasons", according to Swan Song, who should know but part of Zep’s appeal is their unpredictability. Keeping everyone guessing has always been their best strategy. Of the four, Robert Plant was by far the most "social," stopping off at bars uptown and downtown, always in the company of English sound engineer Benjie Le Fevre, and an English bodyguard named David. Plant still walks with a crutch, a wincing reminder of last August's car crash on the Greek island of Rhodes. Although the plaster has now been removed, his usual hurried shuffle has been replaced by a deliberate, careful plod. He doesn't think he'll be able to dance until the beginning of next soccer season, which is tantamount to saying that Led Zeppelin won't be able to perform live until that time also. Indestructible? Obviously not. The fractured foot has stymied Plant's usual punk arrogance. Temporarily, at any rate, he can't run with the pack and this compulsory moderation to the pace of his life seems to have brought about a certain sympathy that wasn't always apparent in his personality. He might look like the proverbial Greek god rock vocalist as he struts magnificently across stages with the studlike hauteur of the rock idiom, but he's human just like the rest of us, broken bones and all. Plant has always seemed rather divorced from reality, often giving the impression of being a leftover from the days of flower power, with his golden curls and brightly-coloured stage tops. That image has been perpetrated by interviews that are both vague and filled with scattered references to peace, love and world understanding – topics that have tarnished considerably in the reality of the Seventies. It was something of a relief then, that the Robert Plant of 1976, with his crutch and newly curled hair, seemed to have come to terms with his public image on a more evenly-balanced level. Goddammit – he phoned me to arrange the time of the following interview, and if that isn't a turn up for the book, then I don't know what is! He had much to talk about: the accident and its consequent effects on the band, his travels to Northern Africa which preceded the crash, the new Led Zeppelin album, and, lastly, some thoughts on the eight-year career of the group. Initially Plant seemed reluctant to discuss the accident, but as the interview progressed he warmed to the subject. "The memory is very vivid, but it's like spilt milk and there's no time to cry over it when there's another bottle around the corner... you know what I mean? "I had the normal instant reaction of anybody and that was for my family who were in the car with me. I didn't know what the implications and the final outcome of the wounds or whatever would turn out to be, but they were of minimal importance at the time. "I didn't think about the possible consequences for the band but as I had plenty of time to lie back – not even sit back – I started gaining a new perspective on the situation. "After I'd been pieced back together I had to think about it all because I didn't really know whether things were going to be the same as they were before...uh, physically." There was a chance, then, that you might be crippled forever? "Mmm, yes. I had to, not so much grow up very quickly, as be prepared to face odds that I never thought I would come up against. "I haven't come out of it too scared, either physically and mentally, and, in fact, once I knew Maureen [Plant's wife] and the kids were OK I really threw myself back into my work. By engrossing myself more and more in the work we had on hand, the time passed by quicker. "If I stop and brood, which is a very bad thing to do, then time moves with a lead weight around it, but the time between August 4 [the date of the accident] and now has gone by quickly because I applied myself to what I do best. I mean... I can do 99 per cent of what I could do before, so we sat down and had a meeting. "We obviously couldn't tour, so we decided to make an album which wouldn't have happened if it hadn't been for me. It was quite remarkable that I found myself sitting in an armchair facing the band with my leg in the air. We were planning to tour right around the world and back to England, playing possibly in South America, Hawaii, Japan and Asia Minor and ending up doing dates in Europe, especially Scandinavia, before dropping anchor in Albion."